Spectacular Glencoe signature home on over 1/2 acre in a premier loc. 1 Blk. East of town/train & 2 1/2 blks from beach. 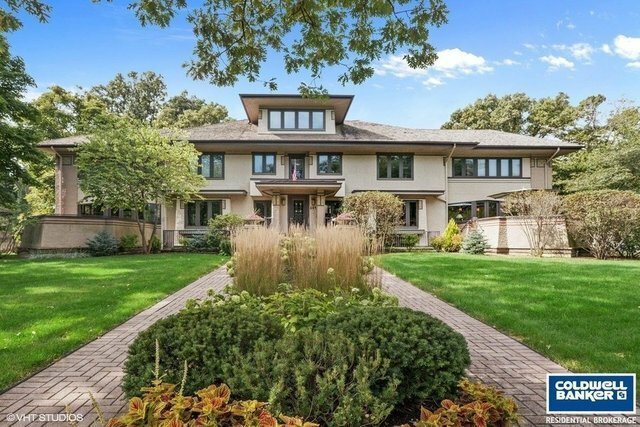 This historic, award-winning home, designed by architect E. E. Roberts was recently, compl. & meticulously expanded & rebuilt to offer all of the amenities of a newer home, while preserving the authenticity & character of the original design. Architectural features include 9' beamed ceilings, chevron arched doorways, 7-piece crown molding, quarter-sawn oak floors & cabs, leaded art glass wndws. Lrg. open floor-plan with great flow. Welcoming foyer, big gourmet top-of-the-line ktchn. open to FR & deck, paneled study w/wet Bar, bright sunroom leading to 2 decks, huge inviting LR w/fplc, sep. DR w/ wainscoting, incred. mstr. ste. w/sitting rm/fplc, 2 wlk-in custom-fitted clsts, beaut. compart. master BA w/lrg soaker tub, steam shwr, 2-sink vanity, yoga Rm, 4 addtl. large BR's up. 2nd flr. lndry. Deep LL w/game rm, wet bar, wine cellar, excer rm, studio/theater & 6th BR.